If you live in the United States, chances are you that dread answering your iPhone when it rings, if you even bother at all. For the past few years, we’ve been suffering a growing epidemic of spam calls—I get three to four a day, and Adam Engst has taken to sending all calls that aren’t from contacts to voicemail (see “Beware “iCloud Breach” Phone Scam,” 23 May 2018). 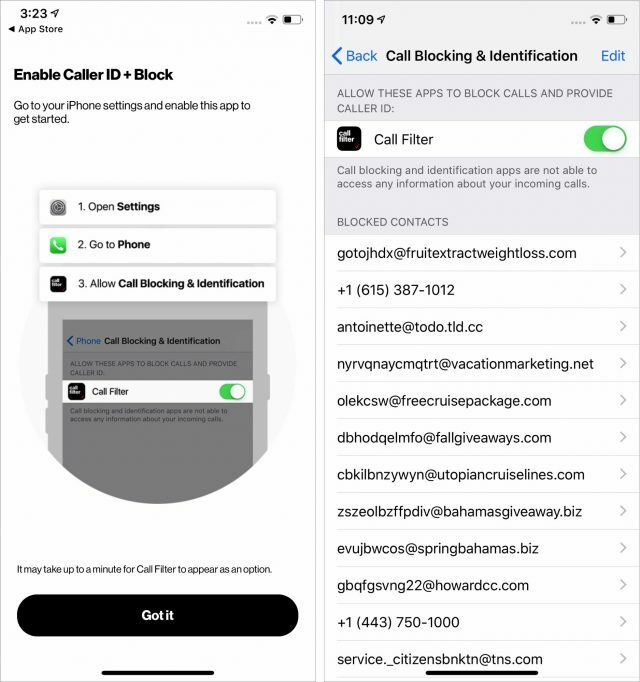 To address this scourge, cellular carriers have started offering free solutions for their customers: AT&T has Call Protect, and T-Mobile provides Scam Block. Until now, Verizon had been charging $2.99 per month for its customers to use its Verizon Call Filter app. 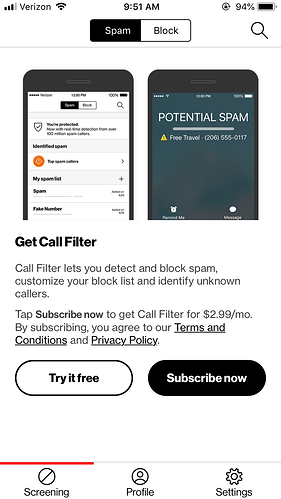 That paid tier is still available, but Verizon now also offers a free tier that lets you identify, block, and report spam calls. 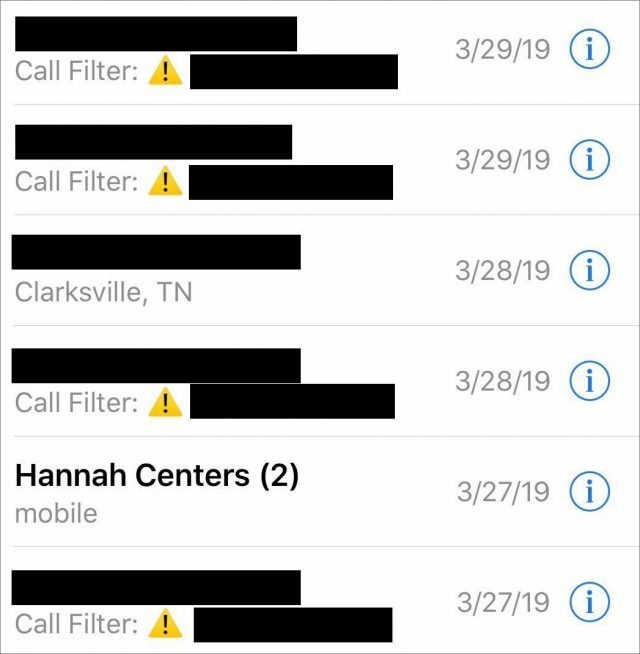 When you first open the Verizon Call Filter app, it prompts you to give it access to your contacts and enable Call Filter in Settings > Phone > Call Blocking & Identification. 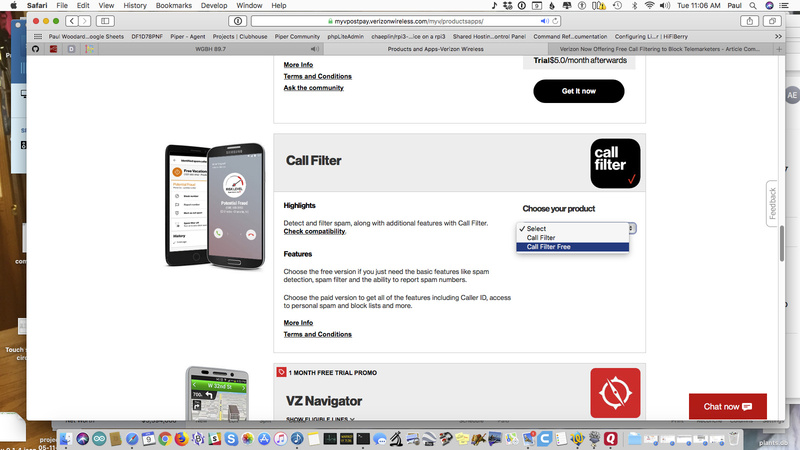 Like many other such apps, Call Filter works through the CallKit framework that Apple released with iOS 10, which also powers apps like Hiya and Robokiller. Next, you have to activate the feature in the Call Filter app itself. Open it, make sure you’re in the Screening screen, and if it says at the top “You’re not protected,” tap “Turn on for free” and follow the prompts. Verizon says that it could take up to an hour for the feature to be enabled on your account, so you might as well leave the app and go do something else for a while. When you return, you’ll know Call Filter is working if, in place of “You’re not protected,” you see “You’re protected.” By default, Call Filter will alert you only if it thinks an incoming call is spam; you can turn that off inside the app by going to the Settings screen and flipping the Spam Detection Alerts switch. 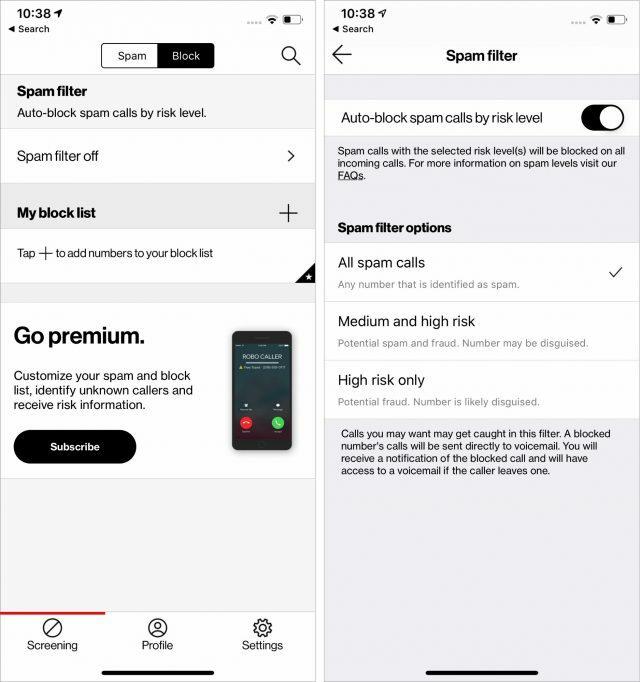 But if you want to get the most out of Call Filter, you want to enable spam filtering, which you can do by going to the Block view of the Screening screen, tapping Spam Filter Off, and then turning on “Auto-block spam calls by risk level.” There are three levels of risk: All Spam Calls, Medium and High Risk, and High Risk Only, with All Spam Calls being the default. You might want to start with High Risk Only to avoid accidentally blocking legitimate calls and then dial it up if you keep getting bogus calls. After using Call Filter for over a week, I can confirm that it works: it blocked four spam calls in a couple of days. For $2.99 per month, Verizon’s Call Filter service will also let you customize the spam and block lists, identify unknown callers, and “receive risk information,” whatever that means. 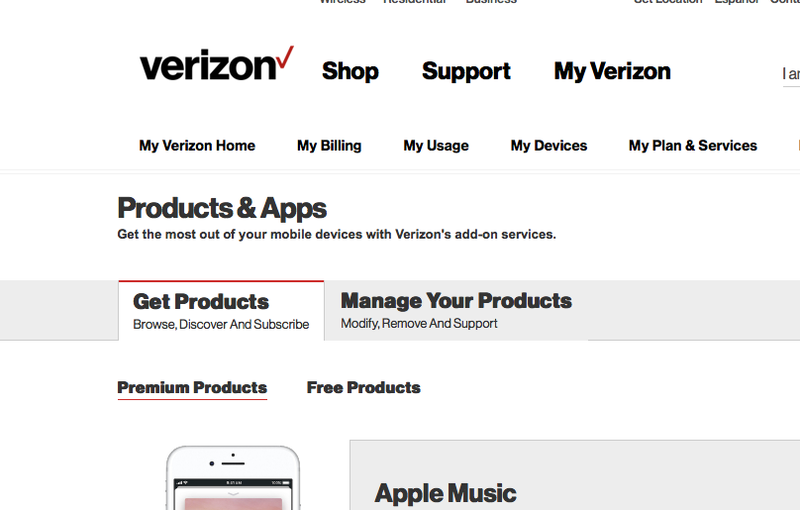 It’s a little chintzy of Verizon to charge extra in the app, but at least the basic features are free and all these apps charge some kind of monthly subscription fee, often to use the service at all. While it’s good that Apple has created CallKit and that carriers are offering these tools, nothing will truly change without government intervention or improvements to our archaic phone system. Fortunately, there is movement on both fronts. 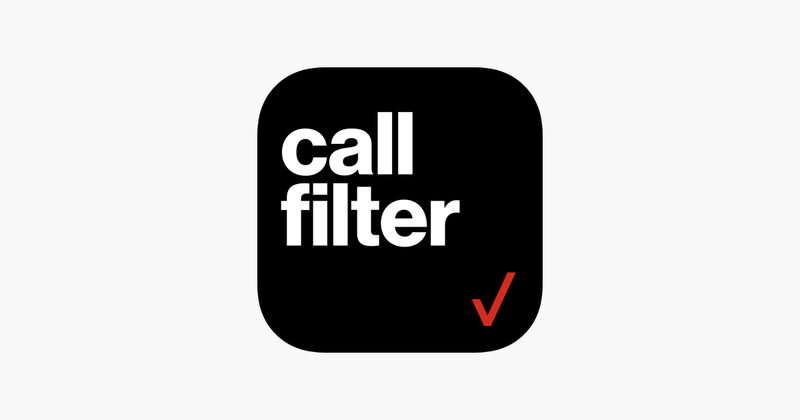 As The Verge reports, part of the reason Verizon is offering Verizon Call Filter for free is because the US Federal Communications Commission has threatened to take action if the carriers don’t put a stop to spam calls by the end of 2019. One of the worst parts about these spam calls, and what makes them tricky to filter out, is that the perpetrators spoof legitimate numbers. I’ve received at least one profanity-laced tirade from someone who was sick of spam calls but didn’t realize that the spammers steal legitimate numbers (mine, in this case). To deal with the spoofing, and to please the FCC, the entire industry is working on a new call authentication technology called STIR/SHAKEN (we’re not making this up! ), which will at least verify that a call is coming from the number it says it is. Until STIR/SHAKEN becomes standard, we’ll have to rely on tools like Verizon’s Call Filter, AT&T’s Call Protect, and T-Mobile’s Scam Block. I just installed the app on my iPhone. No option for a free service. I can try it for free but if I don’t cancel it I will be charged $2.99/mo. The Verizon app has a free tier, while Hiya doesn’t. Are you a Verizon postpaid customer? It’s not an option for pre-paid customers. Did you follow the instructions in the article? They push the subscription pretty hard, but I promise that there’s a free tier. I think Hiya is still available for free; you just don’t get lookups for numbers that belong to individual people unless you subscribe to the premium service. I am looking at my bill due April 8 and it covers 3/17 to 4/16. If I go to Settings and click on Subscribe the options are “Subscribe now” and “Cancel” The text assures me that I will be charged $2.99/mo. I didn’t have that at all. Are you installing the same app that I did? That was my initial suspicion. I just double-checked and followed the link from the article to the app store on my iPhone. 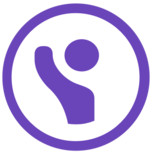 Same up, version 2.1 released a week ago. I feel like I have an older version on my iPhone. Deleting it and installing again. Launched it, so far matching the article for setup. 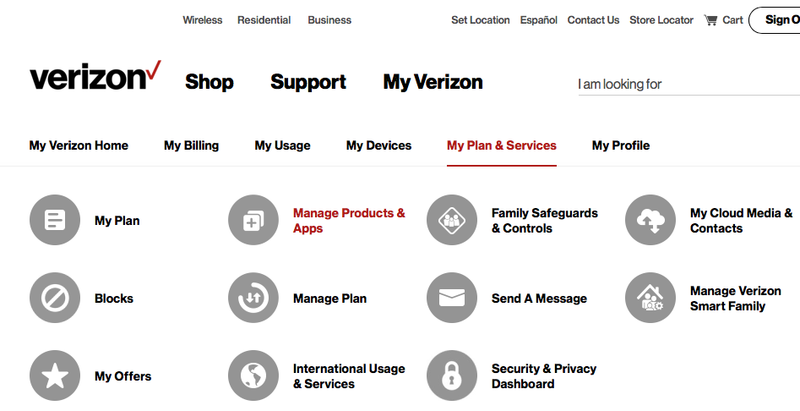 It checked my Verizon subscriber status. And the options again are “Try it free” and “Subscribe now” for $2.99/month. I just unsubscribed and restarted the app. At the very top when I open the app, there is a message next to a shield icon that says “You’re not protected” with a button that says “Turn on for free”. Tap that and I get a new screen that says “Get free spam protection” with “Yes” and “No thanks” buttons. Tap “Yes” and after a minute you get a banner “Activating free spam protection - This may take up to an hour to complete”. Tap Ok on that and the top now says “You’re protected” next to an icon of a shield with a check mark in it. I never get the “Your not protected” message. And version 2.1 advertising itself as free spam protection. I wonder if it has something to do with my subscription status. I see it checking on that issue before trying to sell me a subscription. I recently told a friendly cashier that I didn’t like giving out my phone number to get a discount. She suggested I try <local_area_code>-867-5309. (Search the number if it doesn’t ring any bells.) I’ve used it a few times since, and it has always worked. She suggested I try <local_area_code>-867-5309. If the telephone number links to any kind of account that accumulates benefits, you might try redeeming them periodically (before Jenny does). Thanks. Now I have that song stuck in my head. I’ve given this one and had telemarketers immediately hang up on me. That was back when I would sometimes actually answer a call from one of these vermin. ver 2.2.1 now, when you go to the app window that shows ‘start your free trial’ or option for paid version @$2.99, did you click on the ‘start your free trail’ ? When I do this, I get a new window that says you get full access to the premium version for the trial period of 10days. “you will not be automatically subscribed after the trail ends.” Presumably @Doug Miller subscribed to the 10-day trial of the premium service and then unsubscribed? I get the same issues as PaulC does when trying to find the supposed free service, after installing app and and then piece by piece enabling permissions to use notifications & then later access to my contact list-for which I trust Verizon about as much as Equifax>>> still not showing the icon D.Miller says showed on his iphone? To me, that’s a huge privacy concern.